Though often lusted after, noise-cancelling and fitness headphones aren’t always a good mix. Sure, being able to block out the world around you might help you get into ‘the zone’, but sometimes outside noise is something you still want for safety reasons. It’s into this niche that Plantronics’ first entry into the true wireless headphones category are poised to target. They’re the true wireless headphones for people who want true wireless headphones but don’t want occlusive listening experience. Sporty listeners who want music, but also want truer ambient sound that goes beyond the modes found in the other options. And, to their credit, the mix of specs, design and price here leave the BackBeat FIT 3100 a compelling enough option - even if they do fall far short of the crown. Battery Life: 5 hours, 10 in case. 15 hours total. 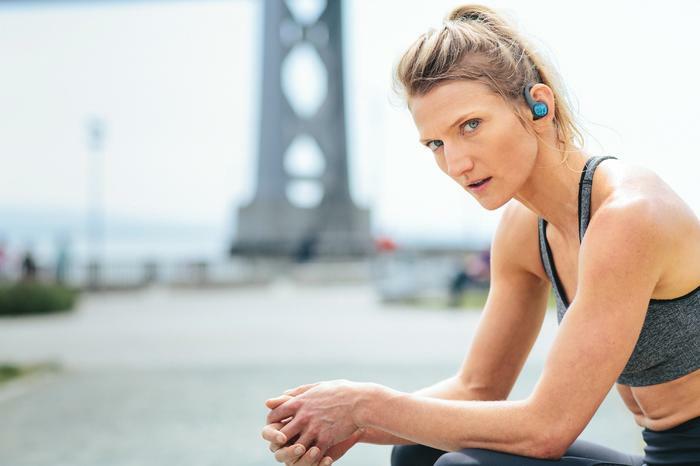 The BackBeat FIT 3100 true wireless earbuds do their best to come across as more practical than stylish. Both up-close and afar, these look like sports earbuds that have had the wires cut off. The buds themselves are circular nodes, with large pronged plastic ear-wings that help ensure they don’t fall out during use. As you’d expect, the BackBeat FIT 3100 come with a carry-case that also doubles as a charger. However, rather than the snappy, hyper-compact, molded plastic found elsewhere, Plantronics have opted for a more rudimentary, zipper-lined solution. This doesn’t look quite as slick as the alternatives, and is also a fair bit bulkier as well. However, that being said, it does have the advantage of never accidentally opening - even if you drop it from a height. For better or worse, Plantronics have opted for Micro USB here over USB Type-C. Still, the BackBeat FIT 3100 do charge fast enough. You’ll get about an hour of listen time from just fifteen minutes of charging. Though fifteen hours of total use doesn’t leave the BackBeat FIT 3100 as any sort of category-frontrunner, Plantronics have been smart to front-load that battery life into the earbuds themselves. For most users, five hours is long enough for any workout. The carry case bumps this up by another ten hours to a total of fifteen. Again, that’s not quite best-in-class - but it’s definitely enough that you’ll probably be able to get by without recharging these for a week or so at a time with regular use. Performance - How Do The BackBeat FIT 3100 Compare To The Competition? And through a regimen of regular use, I found the BackBeat FIT 3100 surprisingly comfortable to wear and offered about what I expected when it came to sound quality. That said, I wish they were a little louder. Most music sounded fine but podcasts were a little difficult to hear if I was near any roads. Still, generally speaking, I’d say that they’re among the more comfortable true wireless earbuds I’ve tested in 2018. Again, the Plantronics BackBeat FIT 3100 sounded crisp enough that I wasn’t particularly unhappy with them. However, at the same time, they didn’t really sound exceptional in their fidelity and balance. They’re good enough, given the price. No more, no less. Assuming your choice in music has enough bass to make it over the top of any ambience noise - you probably won’t be disappointed by the sound here these. That said, if we run the numbers, the BackBeat FIT 3100 don’t quite hold their own as best-in-class. There are headphones out there with better durability ratings, battery life, sound quality and noise-cancelling. However, the price you’re paying here puts them in a unique position. $239 is a pretty competitive price for true wireless earbuds - and the quality of experience here isn’t all that different from that of alternatives that are more (or even double) than the BackBeat FIT 3100’s current asking price. In that context, Plantronics’ debut hold their own as quite competitive. The value here is emboldened by the companion app involved. Sure, having a connected app is nothing particularly unique. However the BackBeat app itself is probably one of the cleanest and most intuitive companion apps we’ve seen paired with a set of true wireless earbuds to date. 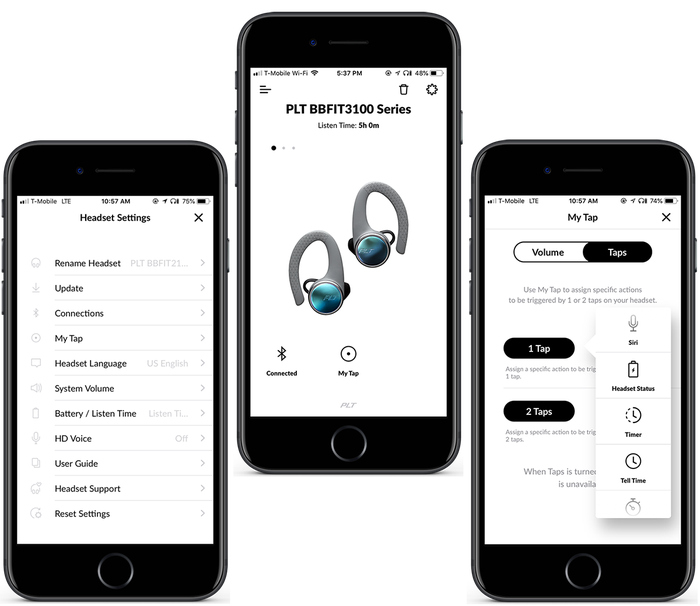 It offers limited control over the sound signature via equalisers and extra toggles that let you customize the various shortcuts attached to the physical and touch controls on the earbuds themselves. In practice, it’s super-straightforward to set up and even more-so to use. Unfortunately, reliability and long-term comfort proved weaknesses for Plantronics’ latest in-ear headphones. The BackBeat FIT 3100 are comfortable enough on your ears initially. However, if you wear them continuously for more than an hour or, they can begin to weigh on your ears. Likewise, most situations saw the Bluetooth connectivity of the BackBeat FIT 3100 deliver as intended. Unfortunately, in wider outdoor environments, the two earbuds did occasionally drop out. They’d reconnect a few seconds later and never entirely fell out of sync, but this was definitely a technical hiccup that hindered our experience nevertheless. The BackBeat FIT 3100 are far from faultless, but they’re well-priced - and that can count for a lot when they do still manage to tick most of the boxes that fitness junkie users will want to see ticked. 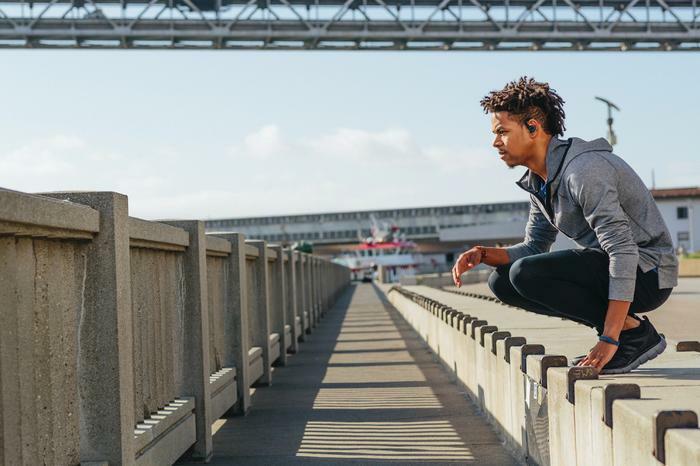 In a category that’s bursting with options, they don’t quite hold up as the best for all audiences - but they’re certainly one worth a serious look if you’re the kind of fitness-conscious user that Plantronics are courting.